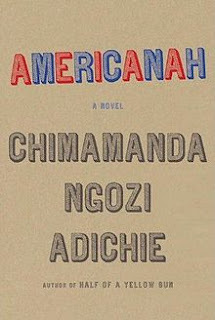 Afrikanist: Vote Americanah by Chimamanda Adichie as New York City's one Book. Vote Americanah by Chimamanda Adichie as New York City's one Book. It was in 2013 that I first came across the book ' Americanah '. I read the review online and the author is one of my favourites so it was easy for me to rush down to the palms mall in Victoria Island, Lagos to get my first copy. Yes my first copy, I gave my first copy, after reading it I gave it to my mother who ' stole ' it and refused to give it back. It was indeed a wonderful book that I could relate with so I bought a second copy. For me it was one of the best books I read in 2013 & mid 2014, it was about Love ,race, hair and diaspora identity. Let me give you a quick swipe of the book; Ifemelu is a young girl in Nigeria who fell in love with her secondary school sweetheart Obinze. They both gained admission into the same university before she left Nigeria for America. As against the conventional idea that african immigrants are always running away from poverty, disease and lack in their home country, this wasn't Ifemelu's case. She wanted more options and choices, she love constant electricity and fast Internet and these things were handy in America. It was in America that she discovered her 'Black' identity, in her home country she never get to worry about race and being Black because there was no need to. Although there were other identity markers in her country like religion, tribe and region but in America should wasn't identified as a Christian or Igbo or a southerner but as a black girl. She later came to accept her new African identity even though she knows nothing about Lesotho or Namibia and the baggage that comes with Being Black. She tried to fight against that 'Americanah' identity that is associated with Nigerian immigrants in America. She discovered that hair is political in America. Obinze on the other hand tried getting an American visa but was denied and he later went to England as an Illegal immigrant and was deported after a few years. In Nigeria he became successful and Rich. Ifemelu returned to Nigeria after 15years to meet Obinze who is already married...go get the book joor if you haven't read it! Please do it now for the love of jollof rice and also for the love of books and the people that make them.